In a previous post, I talked about United Methodism’s implosion. Of course, we are not a building. We are a people. Hence, the implosion can be reversed. What do we do to make the reversal happen? It’s time for me to get constructive. First and above all, we must get serious about how we catechize and nurture our young people. We don’t need to stop everything else to get this done, but we should stop a lot of stuff until we show that we’re actually committed to this mission. Let me tell you about Rose Valley United Methodist Church in Osborne County, Kansas. Some years ago, I was privileged to be invited (twice!) to preach revivals for them and to do some teaching. Rose Valley is a country church NW of Downs, Kansas. If more UM churches will do what they do, we will have new life. They catechize and nurture their young. It starts with intergenerational relationships. Admittedly, this congregation seems caught in a time warp – in a good sense. It is a family church. Grandmas and Grandpas and parents and kids and cousins. It’s a tiny church. But I’m telling you, unless things have fallen off drastically in the past few years, that church is brimming with life in the Spirit because old and young share their commitment to Christ and to one another. Every time I visited, I was amazed at how easily younger and older people talked with each other – like they knew each other and cared about each other. Across the generations, they showed that they shared the mind of Christ. The young were involved with the old in studying the Bible. They talked with one another about faith. They shared ideas and questions. It seemed just as natural for them to pray with one another as to talk about the weather. But they are a family church not only in the genetic sense. One of my trips there, I heard this story. One of the elders of the church, a retired welder and school bus driver, began to pay special attention to a couple of rowdy little boys riding his bus. You know, the kind of boys who trouble just seems to find. He learned that their mother was a single parent, struggling to manage. This elder at Rose Valley UMC invited them to church – and then sat with them to help Mom ride herd on her boys during worship. The church family enfolded this little family and they became family. The United Methodist Church will turn things around denominationally when more and more congregations make this kind of commitment, to live together in Christ with the transparent faith-in-relationship that shows our young we really mean what we profess. 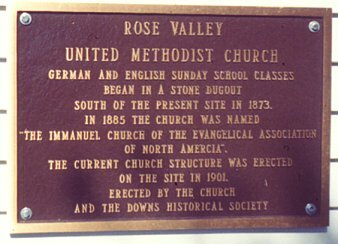 Every time I think about Rose Valley United Methodist Church, I feel convicted. Second and in a related way, we better get serious about doctrine. The United Methodist Church is not a confessional church (we don’t have a UM version of an Augsburg or a Helvetic Confession), but it is a doctrinal church. We have doctrines. I’ve actually heard United Methodist clergy – not many, but enough – say that the UMC is not a doctrinal church. A church without doctrine is an oxymoron. To go back to Rose Valley just one more time, most of the teaching that I’m talking about does not have to happen sitting in a classroom. It happens in the normal course of life. Remember, our young will learn from us either way. What are we teaching them? I hope for every congregation to have an effective, systematic, consistent means of teaching our doctrines. It must be connected to life. But it must be taught. And explained. And vigorously defended. Our faith is worth defending. We need to do what our forbears sought to do, to preach the whole counsel of God. So, yes, we need to talk more about God’s holiness and God’s right to judge us. We need far more than repetitively reminding people that God loves them. Yes, we are deeply grateful for God’s love. No question. But let’s be honest: we presume on God’s love. The way we United Methodists talk about God’s love makes God entirely uninteresting. And undemanding. And that vision of God is not a true one. I hear this regularly from campus ministers who hear it from their students. Yes, they believe in Jesus, the students say, but they really don’t know why believing in Jesus matters. Truth is, it doesn’t, much. We need to teach how and why it matters. I have a pretty good idea how this call sounds to some people, so let me make clear what I mean. I have no interest in excluding anyone! In fact, I’m much more interested in exactly the opposite. Yes, I know, doctrinal orthodoxy can be used to keep people out. But just as important, it can help us see what unifies us. And let’s remember: some kind of orthodoxy will prevail, so we cannot dodge the matter. Second, I pray for vigorous and broad re-engagement with the intellectual content of the Christian faith. We have to develop far more patience for doctrine than I currently see in The UMC as a whole. Don’t leave theology to us academics. Academics have skills and resources to bring to the conversation, to be sure, but all of us must take up the mantle of developing the intellectual life of discipleship. There is a paradox at work here. If done prayerfully, searchingly, openly, engaging the intellectual matter will change our hearts. Fantastic, Steve! You hit the nail on the head. We must have a doctrinal core that determines the message, and then we must live out our doctrine/message in incarnational ways. Thanks for some practical and concrete strategies for renewal. We just finished reading the article “Reversing the Implosion” and thought you had addressed the problems spot on! While we don’t attend a Methodist Church we are very close to the Methodist family because of Ashlee and have a sense of some of the concerns the UMC is dealing with. Thank you, Mark and Virginia. I’m surely glad that you let the Methodists have Ashlee Alley! Wow. This is a bold and powerful article. Having grown up attending a United Methodist Church in Florida, and continuing to do so for years after having a “my heart was strangely warmed” experience with God during my freshman year at SMU over 12 years ago, I have become painfully aware of how far the UMC has strayed from Wesley’s teachings and example of a life of faith. What you said about God’s love and how it is described in most UM Churches also hit close to home. It wasn’t until I had a run in with some “on fire” believers at SMU that God’s love became more than a powerless, irrelevant, experimental idea and became part of my daily experience of life in God. Your words are refreshing to me, Steve and remind me why in many ways I am still a Wesleyan, though no longer officially a United Methodist. I do hope the UMC once again rediscovers the vitality of faith carried by Wesley and Whitfield that led to my great-great grandfather’s conversion at age 18 in 1887 and has continued to deeply impact my life through today. Thank you for carrying the torch, Steve! What you are saying is good and right; but we are not imploding by accident. We have worked hard to implode. By having a tradition of open communion, we have largely eliminated catechism for adults. The traditional approach of actually having to learn about church doctrine and affirm it before you become active in a church is considered outmoded. Bishop Willimon has explained the UMC attitude toward doctrine quite well in saying, “A bishop could now declare (as at least one has) that the Resurrection is hooey and suffer less censure than if he had questioned the wisdom of forming the membership of every committee by quotas for gender, ethnic, geographical, and clerical/lay representation. ” Indeed, when Bishop Sprague wrote a book denying the resurrection, the UM Women’s Division commended it for spiritual formation. Our Council of Bishops would much rather teach about politics than doctrine and that flows down throughout the denomination. Do any of bishops actually exercise the teaching office within their own conferences? A few, like Willimon have written books on doctrine, but they are few and none of their writing is authoritative, good as it is. You certainly have the right idea, but there are tremendous headwinds within the denomination. We need to embark on the journey you suggest, but we need to be aware that we should expect little or no leadership and we need to look for resources outside the denomination. For example, we have gone to Wesleyan rather than Cokesbury curriculum for our Sunday schools because it is more Wesleyan, Biblical, and better teaches doctrine.